Carrots are a root vegetable and one of the most widely eaten foods in the world. The part that we eat is the taproot which grows under the ground which can be purple or red but the most common colour is orange. 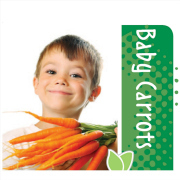 Carrots can grow quite large but baby carrots are harvested when they are between 10 and 14cm long and about 2cm wide. They are much more tender and sweet than large carrots and are higher in beta carotene which helps us to see in the dark. Choose a spot in the garden that gets at least 6 hours of sun every day and prepare the garden bed by removing any weeds and making sure that the soil is loose and free of rocks and stones. Don’t add any compost or manure now as this might make the carrots an odd shape. Water the soil well then use a dibbler or thick stick to make holes in the ground for the seedlings about 15cm apart. Gently remove the seedlings from their punnet and place the root ball in the hole and gently push the soil around it. Carrot seedlings can also be planted into very large containers that are at least 30cm tall. Fill them with premium potting mix and plant the seedlings about 10cm apart. Make sure the pot is in full sun so that it gets at least 6 hours of direct sunlight. 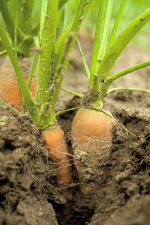 Carrots like the soil to stay consistently moist but without being soggy so water the seedlings every day in summer or every second day if it’s a bit cooler. Apply a liquid fertiliser every two weeks so that they grow steadily and this will help to stop them from becoming tough. 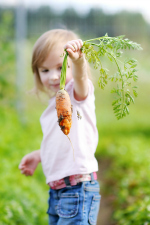 After about 6 weeks, pull one carrot out of the ground to check if it is at least 10cm long and if it is the size that you want it to be, pull the others out as well. Even smaller carrots can be harvested and these are delicious too! Break off the leaves from the top of the carrots and throw them into the compost or the chook pen or give a small amount to rabbits or guinea pigs. Wash the carrots well and eat them straight away or store them in a plastic bag in the fridge. There is nothing quite like eating fresh carrots straight from the garden, after they are washed of course. Baby carrots don’t even need to be peeled so they are really easy to include in salads or for digging into dips. Whole baby carrots can be drizzled with a tiny amount of olive oil and baked on a tray in the oven with other vegetables such as potato and pumpkin pieces. They can also be sliced and then boiled, steamed or microwaved for just a minute or two. Try not to overcook them as they are far more delicious if they still have a bit of crunch. Don’t forget to try some of our delicious carrot recipes in the Smarty Plants Kitchen. Carrots are the taproot of a plant. The taproot grows under the ground and has very thin feeder roots which look like threads that move into the soil to take up nutrients and water. The only part of the carrot that can be seen above the ground are the feathery leaves which we tend not to eat. 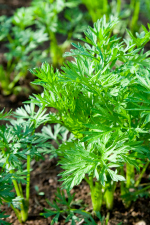 Height/Width: The green leaves on top grow 20cm high and 15cm wide but the carrots will be 12cm long and 3cm wide when harvested. Nutritional Benefits: High in carotene as well as vitamin B & C.
This is the fun part of gardening. These carrots just need to be washed and can then be eaten straight away.